Now that I’ve celebrated the Fourth of July in Washington DC and New Year’s Eve in New York, I can call myself a true American. Accordingly, I felt it was time to visit the Statue of Liberty. I was pleasantly surprised at the price of the ticket: ~$19. Unlike my ~$30 ticket to tour the Palace of Westminster in London, my Statue of Liberty ticket included a boat ride. Plus, the boat ride to Ellis Island comes with the ticket. You’ll want to book your tickets at least 6 weeks in advance so you can pay the additional $3 to go up to the crown, which I imagine offers incredible views. Even if you cannot book that far in advance, you should still be able to get tickets for the Statue of Liberty’s pedestal. I booked my tickets three days in advance and there were pedestal tickets still available. Statue Cruises’s prices as of January 1, 2016. I left from Battery Park at the southern tip of Manhattan. Thankfully I arrived about 45 minutes prior to departure because the entire park was just a long line of people. What made it more confusing is that very few people spoke English and there were multiple lines. Booking my tickets in advance allowed me to wait in the “Reserved” line which moved more quickly than the second line. There is a security check point before you board the ferry. There are about eight metal detectors with eight lines. The process would undoubtedly move faster if some of the directions were provided in languages other than English (very few tourists spoke fluent English). One person went through the metal detector with his hands up (presumably not realizing that it was just a metal detector) and the next ten also proceeded through the metal detector with their hands raised, despite the angry orders from security guards to put their hands down. Only a handful of these ten folks were traveling together. The boat was surprisingly nice considering the sheer number of people that needed to fit on it. The top and middle decks both had seats (unreserved) and the middle deck was heated. The lower deck was not heated but it was fully enclosed. 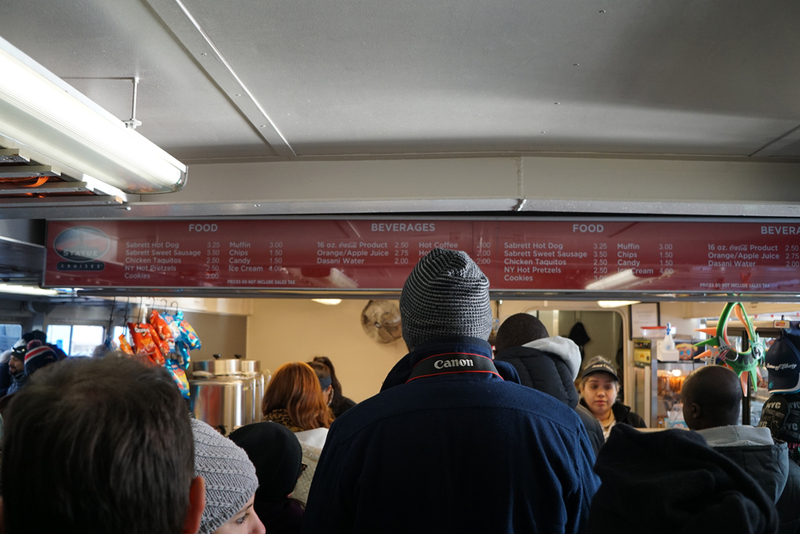 There were two concession stands with reasonable prices given their market monopoly. The ride was fairly short but the top deck gets quite windy. If you’re traveling to the Statue from Battery Park, find a seat on the starboard (right) side of the boat. It has a much better view of the Statue upon arrival (see top photo). New York skyline from the Statue of Liberty island. The island with the Statue of Liberty is beautiful. It offers amazing views of the New York skyline, the Statue itself, and Ellis Island. The entrance to the Statue of Liberty is located behind the Statue and there are separate lines for folks with pedestal and crown tickets. Once inside the Statue, you’ll find a cool museum that explains how it was built and maintained over the years. Once you reach the pedestal level observation deck, you’ll see NPS rangers. Behind those rangers are the steps to the crown (ticket required, see above). I did not make it to the crown but you can see the small staircase from below. The pedestal observation deck is about halfway up the Statue so there were about twice as many stairs leading up to the crown. I climbed about 12 flights of stairs but it was less cumbersome than it sounds. There is also an elevator available to the pedestal level (I’m unsure if it goes to the crown) for those who do not want to take the stairs. The entire trip– Battery Park to the Statue of Liberty to Ellis Island to Battery Park– took about four hours (including my early arrival time). I enjoyed the trip and I’d certainly go back. Next time I’ll book further in advance so I can go to the Statue’s crown. Be the first to comment on "Visiting the Statue of Liberty: Part 1"